In California, the California Energy Commission has issued a Notice of Proposed Award (NOPA) for a $5 million grant to the Aemetis Riverbank cellulosic ethanol biorefinery, and $5 million for West Coast Waste Co., to assist in the development of its innovative commercial-scale, low-carbon biorefinery, known as Madera Renewable Energy One (MADRE I) project. This one is a partnership between West Coast Waste and Enerkem. MADRE I is aimed at producing 45 million gallons per year of cellulosic ethanol from agricultural biomass that is currently subject to open field burning, land application, or disposal. The facility will be located at WCW’s existing 80-acre biomass processing facility at 9537 Road 29 ½ in Madera County and will bring 59 permanent, living-wage jobs to this rural, disadvantaged community. The WCW Team anticipates that the project will receive CEQA-approval during the first quarter of 2019. The Balakian family, the owners of WCW, have been farming in the Madera and Fresno County regions of the Central Valley for over 100 years. Their sister company, California Grinding, Inc. (CGI), began offering nut and citrus tree removal services in 1990. Since CGI’s founding, it has provided these services for 75 different growers and managed more than five million tons of orchard wood. WCW owns two existing operations permitted for biomass handling, composting, and anaerobic digestion. MADRE I will utilize advanced versions of Enerkem’s Edmonton gasification processing line to produce 45 million gallons of cellulosic ethanol, an unprecedented scale in the U.S. and three times the amount that will be produced nationwide in 2018. Its cellulosic ethanol will annually displace roughly 352,000 MTCO2E of gasoline and is expected to achieve a carbon intensity (CI) score of 6 or less. Due to the elimination of open field burning, this project will displace an additional 168,900 MTCO2E per year. This results in an overall cost-effectiveness of $1.92 of CEC funding per metric ton of carbon reduced, assuming a 5-year grant term. The plant will process 330,000 tons per year of almond wood as well as almond shells and pistachio hulls (1,000 “as received” tons per day for a 330-day operating year), dramatically reducing the need for this material to be burned in the field. CGI has committed to provide and prepare this feedstock for MADRE I under a 15-year price-certain agreement. The material will be sourced primarily from Fresno and Madera Counties, which have the largest concentration of growers and acreage in the state. Enerkem has a modular plant design and standardized manufacturing infrastructure in place to enable large scale roll-out. Its waste-to-cellulosic ethanol system has been 90% modularized. Each of its future bioethanol lines will be comprised of 105 prefabricated modules, enabling 80-90% of its related fabrication costs to be de-risked and bid under not-to-exceed contracts prior to the construction phase. We haven’t seen details yet, but there’s a potential technology trigger point in this project. MADRE I is said to be preparing introduce a proprietary technology that will double the cellulosic ethanol output of Enerkem’s technology from 90 to 180 gallons per ton of feedstock. This project will be the first implementation of this innovative addition to the Enerkem process and will also be Enerkem’s first commercial facility to be fueled exclusively by biomass. We’ve yet to see the details, and let’s keep in mind that these are very early days for the project — miles to go with financing, permitting, and this new leap to 180 gallons per ton. Just some speculation along those lines — it feels like there’s something else going into the biomass feed, such as hydrogen. 180 gallons a ton in our back of the envelope calculation, that’s around 1990 pounds of alcohol out of a ton of biomass, or a 59 percent yield. Now, wood waste is around 49 percent carbon, 43 percent oxygen and around 6 percent hydrogen. By mass, ethanol is around 52 percent carbon, around 13 percent hydrogen and about 35 percent oxygen, so adding a little hydrogen in there, the outputs and inputs match up reasonably well. But if you don’t have extra hydrogen, the yields could fall catastrophically, as you might start to see CO2 forming instead of an alcohol. Chemist alter! We’re journalists, not chemists, so we raise this as a flag for discussion, not as a barrier to innovation. The CEC grant program provides California state funding support for projects that reduce air pollution, improve the environment, and lower carbon emissions. The CEC grant will support the state’s goals to reduce greenhouse gas emissions and chronic air pollution in California’s Central Valley through Aemetis’ conversion of waste orchard wood, which could otherwise be burned and released into the air, into low carbon biofuel at the planned Aemetis Riverbank plant. It was big news almost a year ago that Aemetis completed its operation of an integrated demonstration unit for more than 120 days of continuous operations with 94% uptime, meeting the requirements for a federal USDA 9003 Biorefinery Assistance Program guaranteed loan. In partnership with its key technology providers InEnTec and LanzaTech, Aemetis successfully optimized the integration of an advanced arc furnace and gas fermentation technologies to convert waste biomass into low carbon, renewable cellulosic ethanol and fish meal. The unit was built at the InEnTec Technology Center in Richland, Washington and demonstrated the fully integrated system, including biomass handling, gasification, gas clean up, waste treatment and distillation systems. 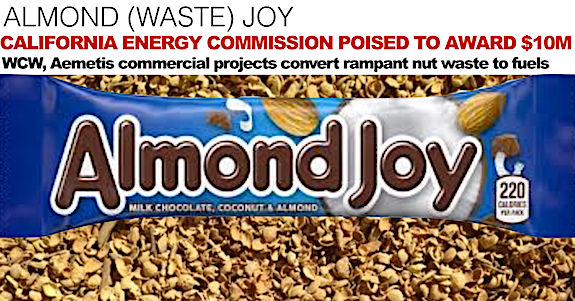 “With 1.5 million acres of almonds and walnuts in the Central Valley generating about 1.6 million tons of waste wood and nutshells each year, about 160 million gallons of cellulosic ethanol needs to be produced to eliminate the air pollution from burning or decomposition of this material (as well as Construction & Demolition, vineyard, dairy and collected food waste). “Set to open in 2019, the Aemetis 12 mgy cellulosic ethanol plant is located at the former Riverbank ammunition plant near Modesto. Using waste orchard wood to produce biofuels is projected to generate more than $70 million of revenues from cellulosic ethanol, fish meal and biogas, and about $50 million of annual positive cash flow. For the demonstration unit, Aemetis used waste orchard wood and nut shells from almond and walnut trees as feedstock, gasified the biomass using a high temperature plasma gasification system to produce synthesis gas (syngas), cooled and cleaned the syngas, and supplied the syngas to a patented gas fermentation bioreactor to produce an ethanol broth. The broth was subsequently distilled to produce commercial grade ethanol. The feedstock to be supplied comes from the more than 1.6 million tons of waste orchard wood and nutshells that are generated each year from approximately 1 million acres of almond, walnut, and pistachio orchards in the Central Valley. Aemetis’ price of the feedstock is approximately $20 per ton delivered for the first ten years. Aemetis plans to construct multiple phases of cellulosic ethanol production and add more than 40 million gallons per year of cellulosic ethanol capacity at the Riverbank, California site. Aemetis has exclusive California rights to the LanzaTech technology for biomass and global rights to the InEnTec gasifier for any use with LanzaTech fermentation. The Aemetis Riverbank project was selected as a “Hot Waste-to-Value Project” in 2018 by Biofuels Digest, citing benefits from the conversion of waste orchard wood into valuable biofuels, the low carbon content of the biofuel produced from agricultural waste, the rise in the value of credits for low carbon fuels under the California Low Carbon Fuel Standard, and the project’s 20-year feedstock supply agreement with fixed prices for 10 years. The proposed CEC grant is in addition to the recently announced $12.7 million sales and use tax waivers by the State of California to reduce the cost of equipment and other purchases for the construction of the Aemetis Riverbank plant. These are Notices of Proposed Awards, so not quite over the finish line yet, but close enough to fill the glasses with bubbly if not time for toasting and quaffing. If you’ve been driving along the San Joaquin Valley any time recently, you’ve no doubt noticed the huge expansion of nut cultivation, the nasty signage about water allocation, and the smog. Thirty years ago, on the drive from Tejon Pass to Tracy, you hardly saw a nut tree by the side of the freeway, just the Harris Ranch and its swarm of cattle, and the farms were much farther to the east back then. The smog has a lot of people worried, and burning orchard waste isn’t helping that one little bit. Converting to higher value products, instead of combusting by fire — that’s a good idea and will help with the soot and particulates, mightily. And, create a new value stream in California with all that home-grown energy made from those home-grown nut tree wastes.